A growing body of research points to the relationship between alcohol and suicide. 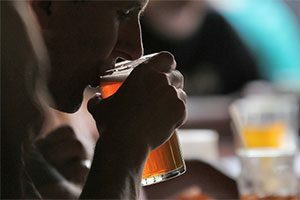 Taking steps to reduce the availability of alcohol may help to reduce the number of suicides, says Raul Caetano, MD, PhD, Senior Research Scientist at the Prevention Research Center of the Pacific Institute for Research and Evaluation in Oakland, California. Dr. Caetano was a co-author of a study published in the journal Addiction in 2015 that found in the United States, the density of both on- and off-premises alcohol outlets in a county is associated positively with alcohol-related suicide. Economic factors also play a role in alcohol-related suicide. In a study published in 2015 in Injury Prevention, Dr. Caetano and colleagues looked at suicide data before, during and after the U.S. recession of 2008-2011. They found the fraction of alcohol-related suicides increased 7 percent after the onset of the recession, from 22.2 percent in 2005-2007 to 23.9 percent in 2008-2011. “These findings suggest that acute alcohol intoxication in suicide interacts with economic conditions, becoming more prevalent during contractions,” the researchers wrote. Alcohol-related suicides during the recession were more common among males. Another study Dr. Caetano co-authored in 2015 found gender differences in alcohol-related suicide. The study, published in Alcoholism: Clinical and Experimental Research, also found differences among ethnic groups. Among men, precipitating circumstances for suicide associated with a high blood alcohol level were physical health and job problems for Blacks, and experiencing a crisis, physical health problems and intimate partner problems for Hispanics. Among women, the researchers found only one precipitating circumstance associated with a high blood alcohol level: substance abuse problems other than alcohol in African-American women. The study concluded that across all ethnic groups, the major risk factor for acute alcohol intoxication prior to suicide is the existence of a prior alcohol problem. “While this is not an unexpected finding, it emphasizes the importance of suicide risk assessment for clients in treatment for alcohol problems,” the researchers wrote.